Sha Tau Kok Village's Chung Ying Street is one of the most unique thoroughfares in the world. It is an open boundary without any physical barriers - no fence, no wall, no barbed wire. With its many shops and restaurants and community living adjacent to it, the northern side of the street is part of Shenzhen, the southern side is part of the HKSAR. For officers attached to Sha Tau Kok Division, policing Chung Ying Street is a formidable and complicated task . . . THE SINO-BRITISH AGREEMENT in 1898 split Sha Tau Kok Village but allowed indigenous villagers of both sides freedom of movement across the Sino-British boundary - now the Shenzhen-Hong Kong boundary - at Chung Ying Street. The boundary is designated solely by a few marker stones. 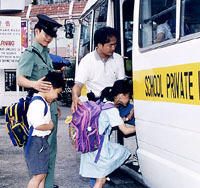 Before implementation of the "Open Door" policy in the mainland in the 1980s, both sides exercised strict control over cross-boundary activities of the street. Economic developments in the mainland have since contributed to the relaxation of control by authorities within the Sha Tau Kok Township, the enclosed area on the Shenzhen side of the Chung Ying Street separated from the rest of Sha Tau Kok by the entry point of the Township. Meanwhile, Chung Ying Street has become a sightseers' mecca on a daily basis attracting as many as 70,000 mainland tourists. But along with the booming tourist trade came businessmen and employment seekers from outside the Township to capitalise on the "Open Door" policy and ensuing business opportunities creating a lot of problems relating to hawking and touting, smuggling, unlawful import and export of goods and illegal employment. "In addition to normal everyday policing, the management of Chung Ying Street is a formidable and complicated task," said Sha Tau Kok Divisional Commander, CIP Gillian Lam Wai-man. "The openness of the boundary, together with the proliferation of shops on both sides of the street/boundary and a community living adjacent to it, has created a lot of problems - many unique. As a matter of legacy, the indigenous villagers on both the Hong Kong and Shenzhen sides of Sha Tau Kok Village have freedom of movement across Chung Ying Street. This has made managing the 'Open Boundary' more difficult than along other parts of the boundary. We have to perform our role in maintaining the integrity of the boundary without overly interfering with these legitimate boundary-crossers and we have to strike a balance." Continued CIP Lam: "Against such an historical background, officers guarding Chung Ying Street must be vigilant in order to identify legitimate boundary-crossers from illegitimate ones. We must constantly reduce these crowds to a manageable level to minimise IIs or other criminals from taking advantage." The consequences of Chung Ying Street police lowering their guard can be very significant. "The officers here are the frontline in terms of keeping the boundary intact. By its very nature, Chung Ying Street almost lends itself to illegal activities and has great potential to be a soft spot for criminals to sneak into the territory," said CIP Lam. 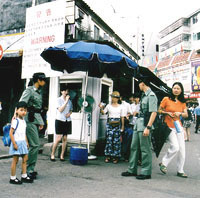 The difficulties of policing at Chung Ying Street (much more complicated than at other boundary control points) are compounded because it is not a gazetted boundary crossing point. "Unlike those in Lo Wu, Man Kam To, or Lok Ma Chau, there is no continual presence of other government agencies to control the movement of people or goods. Officers on guard at Chung Ying Street are frequently faced with duties that are obviously the jurisdiction of other government departments," said CIP Lam. "In 1996, for example, 2,511 kilograms of raw, uninspected meat was seized in a single case at Chung Ying Street. In the absence of other enforcement agencies, discharging these duties are necessary to discourage such abuses and ultimately make the management of the boundary a less formidable task." Over the years police at Chung Ying Street have seized such controlled items and contraband as drugs, live chickens, pirated CDs and, as of May for this year alone, a quantity of false trade mark clothes and imported garments without licence valued at over $4.5 million. The by-products of such protected animal species as pangolins, owls, eagles and tigers have also been, and continue to be seized. 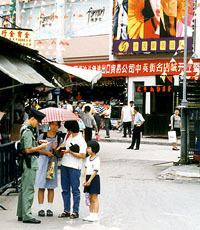 At the height of the Bird Flu scare, when live poultry was prohibited from being sold in Hong Kong's markets, Chung Ying Street police were continually preventing boundary-crossers from smuggling chickens into the territory. "Although the openness of the boundary at Chung Ying Street looks vulnerable in terms of policing it, there are remedial measures in place to make up for the lack of physical barriers," CIP Lam noted. "These include the setting up of police posts at Choi Yuen Kok (the back door of Chung Ying Street), Sha Lan Ha (a post close to the sea), and Shek Chung Au (the only land route for entry into Sha Tau Kok where all public transport vehicles are routinely checked). The divisional police also mount patrols inside and outside the Chung Ying Street area." Close liaison between Hong Kong Police and the Sixth Brigade of the People's Armed Police has also helped to reduce the number of illegal immigrants attempting to sneak into Sha Tau Kok Township. The number of pregnant IIs attempting to use Chung Ying Street to enter Hong Kong, for example, has dropped significantly from 154 in 1991 to 15 in the first five months this year. Still (come rain or shine, damp winter chill or summer heat and humidity), Hong Kong Police standing guard at Chung Ying Street remain ever vigilant in their verification of the identity of boundary-crossers, in their search for controlled items or contraband and in their management of the crowds. "Our officers do an excellent job, and Divisional management has been striving to improve their physical working conditions - because they deserve it," said CIP Lam. "Among other things, we're arranging a permanent overhead shelter to be constructed at Chung Ying Street post to protect officers from the weather."